Located within walking distance of shopping and dining, the Gold Convention Centre and The Star Casino, Aruba Beach Resort offers colourful, self-catering accommodation just a short stroll from the beach. The convenient location and affordable accommodation makes this resort popular with families. Located within walking distance of the Surf Clubs, Pacific Fair, The Star Gold Coast Casino and a range of local shopping, dining, activities and attractions, Bel Air on Broadbeach offers self-catering apartment accommodation with an outstanding range of onsite facilities and spectacular views of the ocean and hinterland. Offering an individually-decorated range of self-catering 4.5 star apartment accommodation, Belle Maison Apartments is situated on 2 acres of manicured gardens and enjoys views of the ocean and hinterland. Home to a great range of onsite facilities, the resort is located within walking distance of a range of local shopping, dining and attractions including the Gold Coast Convention and Exhibition Centre, Pacific Fair Shopping Centre and the Casino. Located right on the beachfront, Boulevard North Holiday Apartments offers self-catering apartment accommodation in the heart of Broadbeach. Home to a great range of onsite facilities, this family friendly resort is within walking distance of a wide range of local shopping, dining, activities and attractions including the specialty stores of Niecon Plaza, the dazzling nightlife of The Star Gold Coast and the trendy café and restaurant precinct. Located just metres from the stunning Broadbeach waterfront, BreakFree Diamond Beach offers self-catering holiday apartment accommodation with a host of onsite facilities. Surrounded by tropical gardens and cascading waterfalls, the resort enjoys easy access to shopping, dining, activities and attractions. Centrally located to the cosmopolitan range of shopping and dining options, Broadbeach Savannah Resort offers a choice of Studios, Suites and Apartments with a touch of luxury. 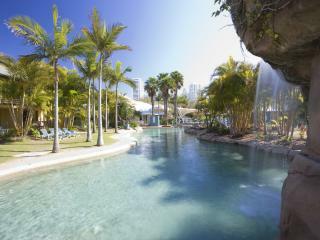 The resort is also just a short distance from Pacific Fair, the Casino, the beachfront and a host of major attractions. Located just 650m from the beach, Broadbeach Travel Inn Apartments offers well-appointed accommodation in the heart of Broadbeach. Close to local shopping, dining and attractions, the resort is home to a convenient range of onsite facilities and is less than half an hour from the Gold Coast Airport. Within walking distance of Jupiter’s Casino and Pacific Fair Shopping Centre, the resort is also just minutes from the Gold Coast Convention Centre. Situated just one block from the famous Gold Coast beaches, Island Beach Resort offers comfortable, contemporary apartment accommodation just a short stroll from a range of shopping, dining and entertainment options. Just minutes from popular activities and attractions, the resort is home to a great range of onsite facilities and is within walking distance of Pacific Fair Shopping Centre, the Gold Coast Convention Centre and the Casino. 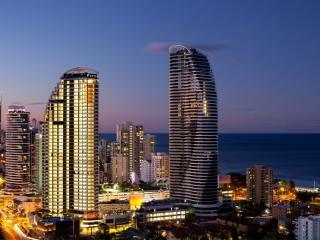 Located in the heart of Broadbeach, Mantra Broadbeach on the Park offers a luxury holiday experience featuring apartment accommodation and world class facilities. Surrounded by some of the Gold Coast's best surf beaches, the resort is just minutes from major attractions including the Casino and Pacific Fair. Offering luxury accommodation surrounded by beautiful beaches and delicious dining, Mantra Sierra Grand is just a short stroll from some of Broadbeach's most popular shopping and activities. Also boasting a full range of onsite facilities, the resort enjoy easy access to some of the Gold Coast's top attractions. Offering comfortable and affordable apartment accommodation for families and couples, Neptune Resort is situated in the heart of Broadbeach and is just walking distance from an excellent range of shopping, dining, activities and attractions. With public transport at your door, getting around is easy however thanks to the resort’s convenient location, you’re also just a short stroll from Kurrawa Beach and famous attractions like Dracula’s Cabaret Restaurant, theCasino, Pacific Fair Shopping Centre and much more. Centrally located to all the excitement of the Gold Coast, Ocean Royale offers apartment accommodation 50 metres from the rolling surf at Broadbeach. Boasting a great range of onsite facilities, the resort is just footsteps from some of the region’s best beaches and conveniently close to exciting local shopping, dining and attractions including Pacific Fair Shopping Centre, Dracula’s Cabaret Restaurant, the Gold Coast Convention and Exhibition Centre and the Casino. Situated within minutes of the centre of Broadbeach and Surfers Paradise, Oceana on Broadbeach offers spacious, self contained apartment accommodation on absolute beach frontage. Home to a great range of onsite facilities, the resort is set in a peaceful and quiet location within walking distance of the Casino, Pacific Fair Shopping Centre and the Gold Coast Convention and Exhibition Centre. Situated in the heart of Broadbeach on the Gold Coast, Peppers Broadbeach offers deluxe accommodation and a wide range of onsite facilities in a convenient location. Surrounded by local shopping and dining, the resort enjoys easy access to major Gold Coast attractions including the famous theme parks. Offering luxury accommodation and a great range of onsite facilities, The Phoenician Resort, Broadbeach is located within walking distance of a fantastic range of patrolled surf beaches. 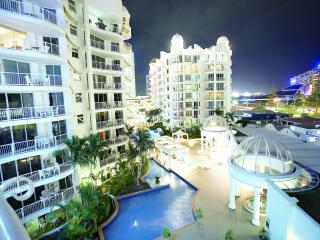 The resort is also conveniently close to a range of shopping, dining, activities and attractions. Offering self contained 1 and 2 bedroom apartments, Portobello Resort Apartments is situated just a short stroll from the pristine sands of Broadbeach. Spread across 4 storeys, the walk up resort enjoys a Mediterranean style with a buttery yellow exterior and contrasting blue accents. Home to a great range of onsite facilities, the resort is close to a range of local shopping, dining and attractions including the Casino and Pacific Fair Shopping Centre. Just minutes from the surf beaches of Surfers Paradise, Pacific Fair, the Casino and popular Gold Coast attractions, RACV Royal Pines Resort offers luxury accommodation in the Coast's only combined resort and 27-hole championship golf course. Situated within a short stroll of the beachfront promenade, San Mateo on Broadbeach offers self contained apartment accommodation just 50 metres from the patrolled beach between Broadbeach and Surfers Paradise. Home to a great range of onsite facilities, the resort is close to local shopping, dining and attractions including Pacific Fair Shopping Centre, Oasis Shopping Centre, the casino at The Star Gold Coast and the Gold Coast Convention Centre. Ideally located directly opposite Kurrawa Beach in the heart of Broadbeach, Sandpiper Apartments offer self contained apartment accommodation spread across 12 storeys. Enjoying views of the nearby park and Pacific Ocean, the resort is also home to a convenient range of onsite facilities and is within walking distance of a great range of shopping, dining, activities and attractions including Oasis Shopping Centre, Pacific Fair Shopping Centre, the Casino and the Kurrawa Surf Club. Adjoining the Oasis Shopping Centre, Sofitel Gold Coast Broadbeach offers luxury accommodation surrounded by your every holiday need. Just minutes from patrolled surf beaches, contemporary dining and a range of local activities and attractions, the resort also enjoys easy access to theme parks. Situated right on Broadbeach Mall, South Pacific Plaza offers individually furnished apartment accommodation within metres of Kurrawa Beach. Just 20 minutes from the Gold Coast Airport with shuttle options available, the resort enjoys a great range of onsite facilities and is within walking distance of a great range of local shopping, dining, activities and attractions including the premier Broadbeach restaurant precinct, the Casino, Pacific Fair Shopping Centre and much more. 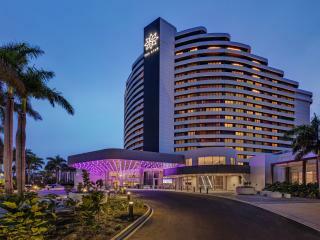 The Star Grand at The Star Gold Coast combines the luxury and sophistication of a world class hotel with the excitement of award-winning restaurants, lively bars, spectacular stage shows and concerts, plus the non-stop action of a 24-hour casino. 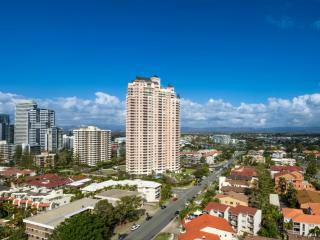 ULTIQA Air on Broadbeach features breathtaking ocean views and a stunning surf side location at Broadbeach. This contemporary and stylish apartment accommodation is within a short walk to surf beaches, cafes and shopping, and The Star Gold Coast Casino and Gold Coast Convention & Exhibition Centre is also conveniently located nearby. Couples and families alike will love the spacious apartment living and resort facilities including swimming pool, tennis court and gymnasium at ULTIQA Air on Broadbeach . Situated on the stunning beachfront of Broadbeach, ULTIQA Beach Haven at Broadbeach offers self-catering family friendly accommodation with excellent onsite facilities. Within walking distance of many of the Gold Coast's most popular attractions, the resort also offers plenty of shopping and dining choices and easy access to the theme parks. ULTIQA Freshwater Point Resort is relaxing and affordable self catering accommodation at Broadbeach located on the river directly opposite the Gold Coast Convention & Exhibition Centre. This family friendly Gold Coast accommodation features 1, 2 & 3 Bedroom Apartments with full kitchen and laundry facilities, cable TV, DVD players and internet connection. The resort also offers great facilities including swimming pool, cafe, gymnasium and barbecue area. Boasting spectacular 180 degree skyline, hinterland or ocean views, Ultra Broadbeach offers modern affordable self contained 1, 2 and 3 bedroom apartments one block from the beach. Enjoying a convenient range of onsite facilities, the resort also offers easy access to theme parks, the Casino, Pacific Fair and Surfers Paradise.